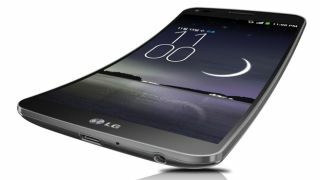 EE has confirmed that it will be displaying (yes displaying, not selling) the curved LG G Flex in the UK from December 20 in a handful of stores. The rather odd move from the network will allow customers to go to one of 10 EE stores to get hands on with the G Flex ahead of its official European launch in 2014 - but you won't actually be able to take one home, so put your money away. The LG G Flex will work with EE's 4G and double-speed 4G network, while the unique elastic coating on the back of the handset sports self-healing properties allowing it to absorb minor scratches and nicks. For those of you screaming "shut up and take my money", EE has confirmed the LG G Flex release date as February 2014 for the UK, although pricing will be revealed nearer the time. The LG G Flex is already available in certain other countries, so the delayed release in the UK is already a little disappointing and the teasing of the phone in a handful of stores may only infuriate those desperately seeking a bendy handset further. If you fancy checking out the G Flex before it goes on sale then you'll need to head to Bluewater Shopping Centre, Kent; The Trafford Centre, Manchester; The Merryhill Centre, Merry Hill; Meadowhall Centre, Sheffield; 40-41 Lions Yard, Cambridge; 209-210 Western Road, Brighton; 16 Clumber Street, Nottingham or one of three EE stores in London - Westfield Shopping Centre, Stratford; Westfield Shopping Centre, White City or 155/157 Oxford Street.